Cat's Walks: Blogs of Note: What's up Los Banos? 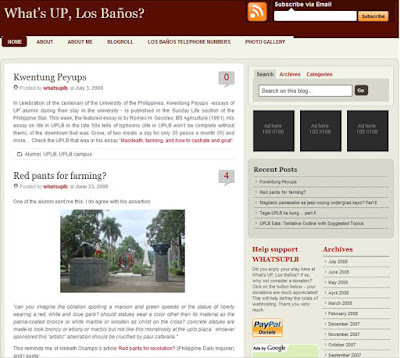 Blogs of Note: What's up Los Banos? I was born at the UP Los Banos Infirmary. I studied elementary school, high school, B.S. , and M.S. in UPLB. My parents worked in UPLB. We lived at the UP Housing. I worked in IRRI for 5 years. Most of my life's memories are concentrated in the 4031 zip code. I was quite happy to find What's up Los Banos? while blog hopping the other day. I really love the post about the PhySci waiting shed after the Milenyo and the old Chem building fire. I remember watching the old chem fire from BioSci. I can still feel the heat just as if it happened only yesterday. We saw the smoke from a friends house in Faculty. We ran to BioSci to see what was happening. We watched the old chem burn in silence. A few years ago, when I was in college, they changed the route of the jeepney that we didn't have to use the PhySci waiting shed anymore (I think they made the road one-way). I remember being very sad just because of the thought I will not use the shed again. I have a memory set in every waiting shed, tree, road, bridge, building, restaurant in Los Banos it seems. "What's up Los Banos?" takes me home everyday even if I am so far away. Wah. I lab Elbi. Dapat diyan ako magta-transfer imbes na sa Diliman. Kaso strict sila sa tranferees. Dapat maga- Agri/Agribussiness Mgt ako diyan. Wehehe! Pero OK lang. GO UP pa rin! Thanks for the feature! This a personal hobby of mine though I haven't updated it for some time.